1882. Machine for rolling boiler plate rings. 1899. 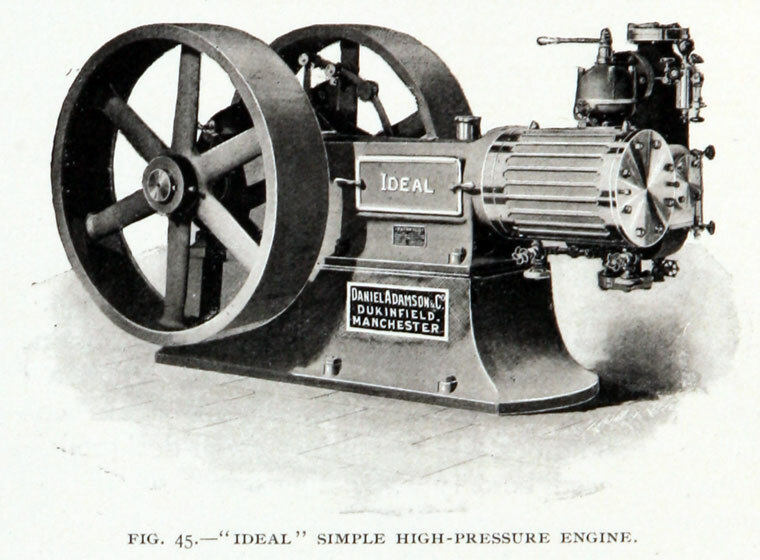 "Ideal" Simple high-pressure engine. No 11099. Exhibit at the National Brewery Centre. No 11099 (detail). Exhibit at the National Brewery Centre. 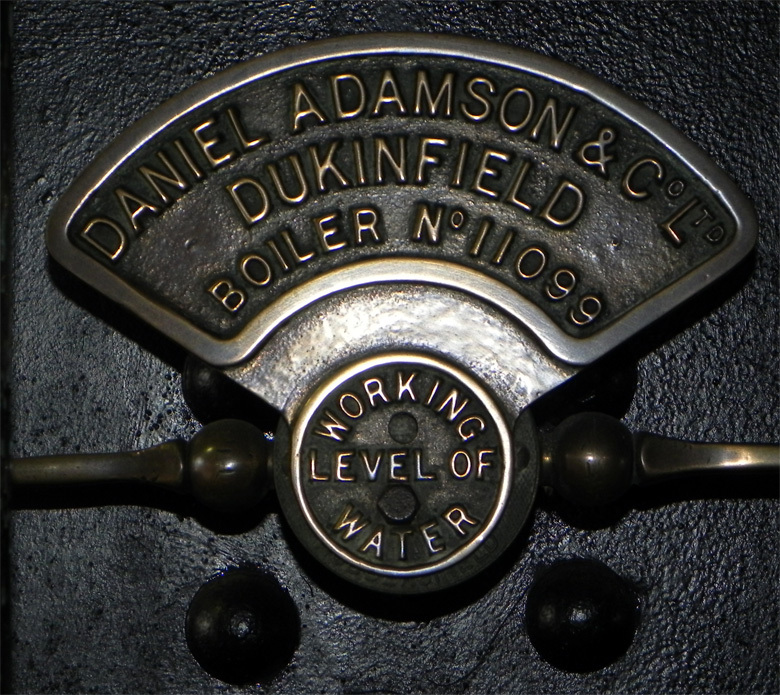 Daniel Adamson and Co of Dukinfield, near Manchester, specialising in engine and boiler making. 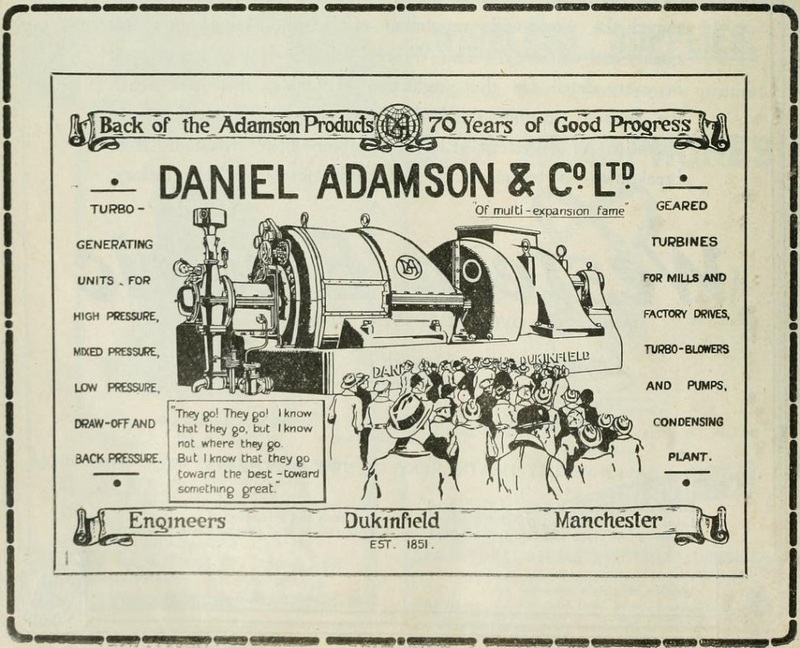 1851 Daniel Adamson established an iron works at Newton Moor near Dukinfield. 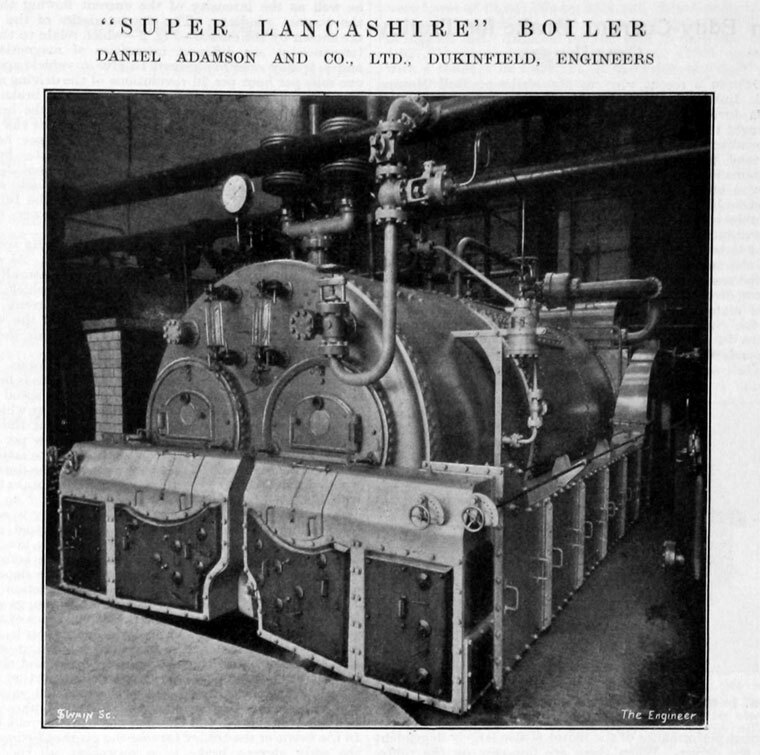 Initially, he followed designs created by Timothy Hackworth, but he improved the design and manufacturing process (pioneering the use of steel and taking out 19 patents in the process) over the next 36 years, exporting Manchester Boilers worldwide. 1866-1890 They built locomotives for Platt Bros and Co of Oldham and Oakeley Slate Quarries in North Wales. 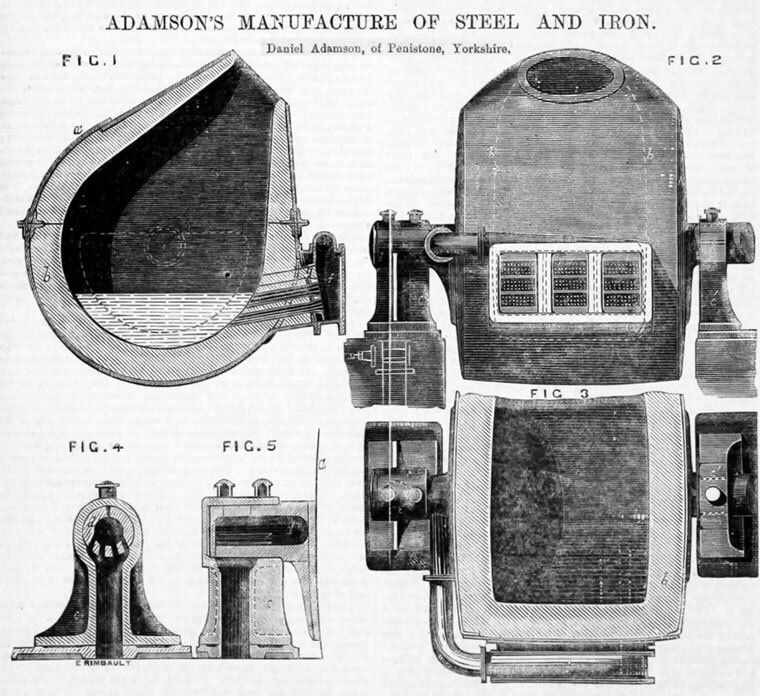 1872 Adamson erected new and larger engineering works at Hyde Junction, Dukinfield, near Manchester, which subsequently were greatly enlarged, and were fitted with the most modern machinery. 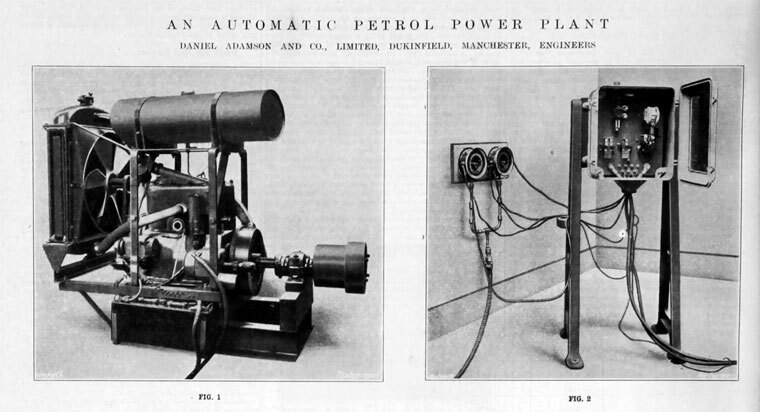 1880 Advertising as makers of Wheelock automatic expansion engines, boilers, blowers, Bessemer plant, testing machines, etc. 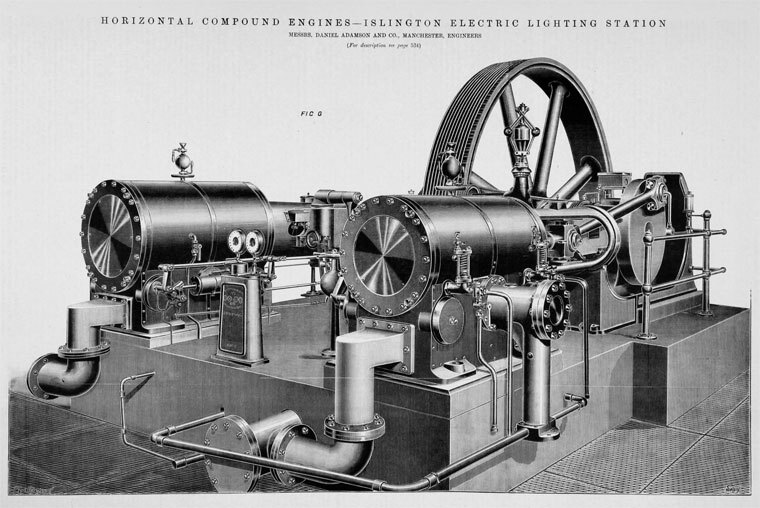 1886 At the Edinburgh International Exhibition in 1886 Adamson's horizontal engine, which had been used for driving the electric-lighting machinery, was awarded the gold medal. 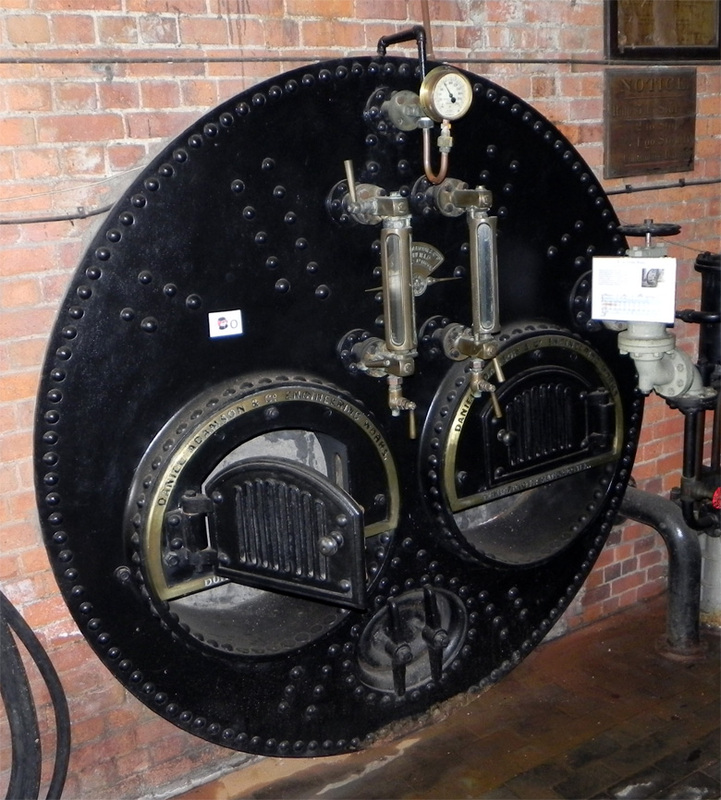 1887 Made improvements in the flues and shells of boilers, and in the machinery employed for making them; a labour-saving arrangement was developed by which as many as twelve tools could be worked simultaneously on a 60-ton bed. 1890 He employed some 600 people. 1903 Engine for St David's Tinplate Works. 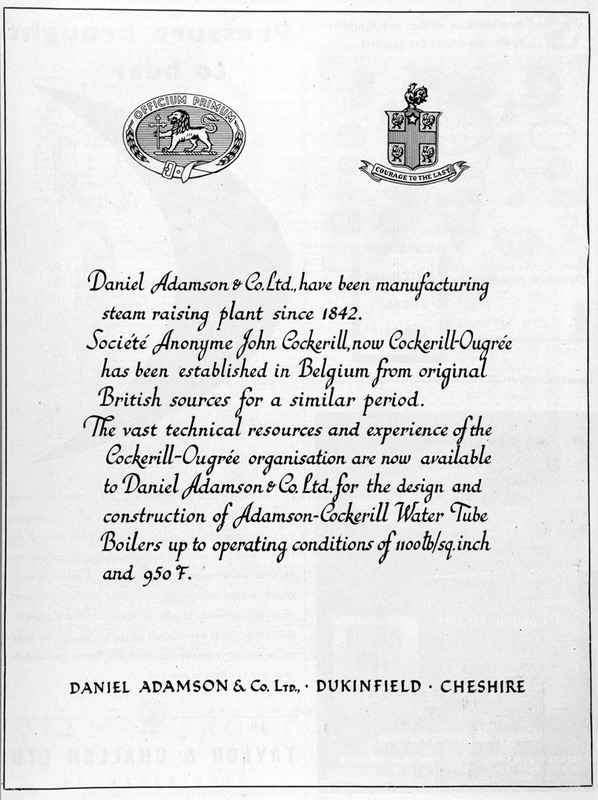 1964 Daniel Adamson and Co remained a family business until it was sold to Acrow (Engineers). Daniel Adamson and Co., of Dukinfield, near Manchester, early in 1858 constructed a common road locomotive for Mr. Schmidt, which worked very satisfactorily. 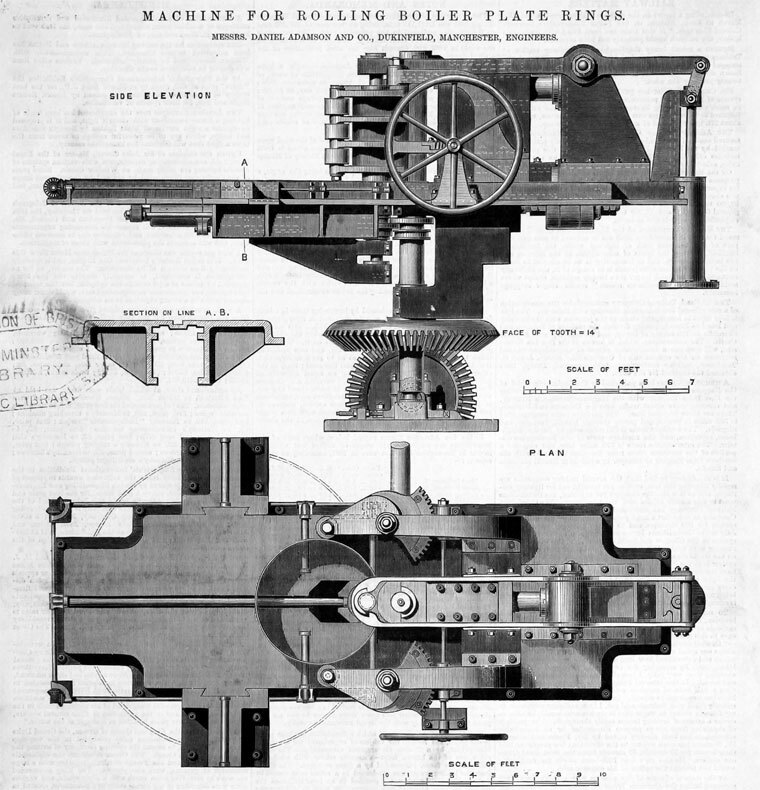 The boiler was of the ordinary locomotive multitubular type, 2.5ft in diameter, and 5.5ft. long, and intended for a working pressure of 150 lb. per square inch. The engine weighed 56 cwt., and was supported on three wheels. The tank underneath contained 70 gallons of feed water, and the engine was designed for running at eight miles an hour. A steam cylinder, of 6in. diameter, was attached to each side of the locomotive. These cylinders actuated a pair of driving wheels, 3ft. 6in. in diameter. Underneath the front of the carriage a single wheel was employed for steering. Many trials were conducted by Mr. Schmidt in various parts of the country. The following race is recorded in the technical papers for August 30th, 1867. On Monday morning in accordance with previous arrangement, two road steam carriages — one made by Mr. I. W. Boulton, of Ashton-under-Lyne; the other made by Messrs. Daniel Adamson and Co., of Dukinfield — started from Ashton-under-Lyne, at 4.30 a.m., for the show ground at Old Trafford, a distance of over eight miles. The larger engine, made by Messrs. Adamson, was a very well- constructed engine, but the smaller one passed it during the first mile, and kept a good lead of it all the way, arriving at Old Trafford under the hour, having to run slowly through Manchester. 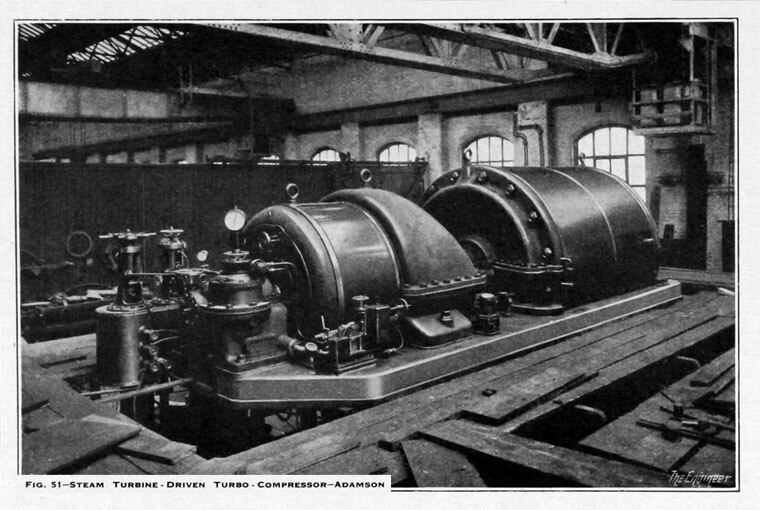 The running of both engines was considered very good. On arrival at Old Trafford they tested their turning qualities. Mr. Schmidt sent this road locomotive to the Havre Exhibition, in 1868, and in accordance with his request a trial of its powers was made by French engineers, and M. Nicole, director of the exhibition. Mr. Schmidt conducted the engine himself, and to it was attached an omnibus containing the commissioners. The engine and carriage traversed several streets of Havre, and mounted a sharp incline. A very satisfactory report was drawn up by M. Ed. Croppi, and sent to several of the journals. Other trips were made to several villages in the neighbourhood of the exhibition, all of which were of a very creditable character. This page was last edited on 26 March 2019, at 23:50.